33.25 (35.5, 38.5, 41.75, 44.75, 48, 51, 54)” / 84.5 (90, 98, 106, 113.5, 122, 129.5, 137) cm. 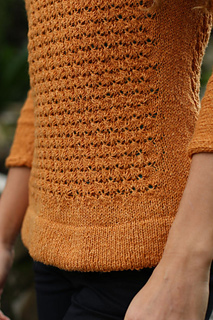 I completely fell in love with the delicate texture and faint diagonals of the Clustered Star pattern stitch, which takes centre stage in this sweater. Worked in the round from the bottom up, there is gentle waist shaping, sleeves worked in one piece, and short row shoulder shaping. To Fit Actual Bust Circumference up to: 32.25 (34.5, 37.5, 40.75, 43.75, 47, 50, 53)” / 82 (87.5, 95.5, 103.5, 111, 119.5, 127, 134.5) cm. 1-3” / 2.5-7.5 cm positive ease recommended. Bust Circumference: 33.25 (35.5, 38.5, 41.75, 44.75, 48, 51, 54)” / 84.5 (90, 98, 106, 113.5, 122, 129.5, 137) cm. Size 35.5” / 90 cm modelled with 1”/ 2.5 cm positive ease. Tapestry needle, stitch markers, waste yarn, size ‘G-6’ / 4 mm crochet hook. Provisional cast-on, Cable cast-on, 3-needle bind off, I-Cord bind-off and Short Rows. The stitch pattern is written out and a detailed schematic is provided.